A workaround was posted to the sipx-users mailing list by Chris St. Dennis. You need to have Polycom firmware 3.1.0b firmware on the phone. It has been reported that this works with sipx 3.8.1 and 3.10.2 between phones and phone to AudioCodes and Patton gateways. To modify the template so that when phone profiles are generated the settings get in there for all Polycom phones, edit the template file /etc/sipxpbx/polycom/mac-address.d/sip-2.0.cfg.vm. It's been a little quiet on the sipX world lately. Great progress is being made on version 4.0. Looks like the release however is going to be pushed to late February of 2009. It will be a big release however with NAT Traversal, ITSP bridging, Conferencing Server (thanks to FreePBX), Music on Hold for the Polycoms & their version 3.1.0 firmware and the addition of the Aastra 5x series of phones into the configurator. Seems like the assimilation of Pingtel by Nortel has gone relatively smooth (from the outside looking in). Development is continuing at a hurried pace with the extra resouces available now as well. Effective last Monday (11 Aug), the assets of the former Pingtel have been purchased by Nortel Networks Corporation . As most members of our community will have noticed, Nortel has been a major supporter of the sipXecs project for over a year now, with many Nortel employees making important contributions. The Nortel SCS 500 http://www.nortel.com/scs500 is based on sipXecs. I'm happy to say that the entire Pingtel team has moved to Nortel, and that our commitment to the sipXecs open source project is unchanged. The project goes on as it has been; indeed, with the greater resources of Nortel behind it, we expect to be able to expand our scope considerably. This will not affect any of the project infrastructure - all the lists and other resources remain the same. There will be some brief outages in some services when we move some of the servers to a Nortel facility, but these should not last more than a few days. You'll see the pingtel.com email addresses change to nortel.com addresses. Having this kind of commitment from an industry leader in telecom is a great endorsement of all that the sipXecs community has achieved. To all of you who have contributed your ideas, your enthusiasm, and your code: thank you again, and I hope you'll join me in celebrating this new milestone. 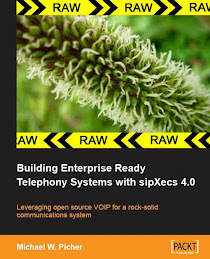 So, you've got your fancy SIP phone system all setup and now you want to connect it to the outside world (to an ITSP or to another SIP PBX). Some may be lucky enough to have NAT traversal built in but many are not. Even if you do have NAT traversal built into your product, how secure is it? Does it support near-end and far-end NAT traversal? In the sipX world we'll need to wait for release 4.0 for NAT traversal to be built in. In the mean time here are some possible solutions. Polycom SIP firmware version 3.1.0 is due around the end of August. We knew it was coming as Pingtel said they were testing an engineering release, we just didn't know when... and now we do! This will be a huge boost for users of the system! At present the Snom phones are one of the few who support MoH on sipX.